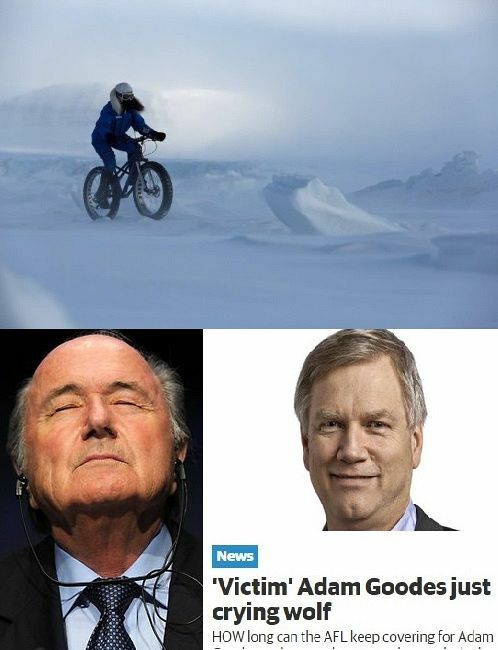 In sport this week, Lachlan Barker looks at an extreme cyclist doing great good, an outstanding AFL player being subjected to appalling racism, and crime and corruption in the tawdry world of international soccer administration. SPORT THIS WEEK involves two unhappy topics and one you may find uplifting. On the up is Kate Leeming, an extreme cyclist who is planning a ride across Antarctica to raise money for HIV/AIDS. We’ll hear more from Kate to conclude, but first we go to alleged corruption, then racism. Soccer is governed, if that’s not too loose a term for it, by FIFA. This organisation had the unholy ignominy of having seven senior officials dragged away from a hotel in Switzerland and extradited to the United States to face charges relating to bribery, racketeering and money-laundering involving tens of millions of dollars since 1991. This occurred on the eve of the election for FIFA president and the long serving man in the top job, Sepp Blatter, had the brass neck to run again. He was duly elected and so it seems Blatter is planning business as usual. And for the last 25 years, as "business as usual" culminated in seven officials being charged with bribery and corruption, one can only shake one's head in wonder at Blatter’s gall. He doesn’t see a problem here, saying that this is all a beat up by the "English media and the American movement" because of their failed World Cup bids. England lost out to Russia for the 2018 World Cup and have cried foul of corruption over the process. Australia likewise lost out in our bid to Qatar in 2022, with Australian officials likewise less than impressed with an outcome that saw Australia garner just one vote — its own. To be fair to Blatter, although he has called for the rule of law to be followed, saying U.S. allegations against the officials have yet to be proven. Well, okay, Sepp — does that mean that if all these seven are convicted of bribery and corruption, then you will accept the umpire’s decision and stand down as the, now proven, corruption occurred on your watch? Don’t hold your breath. However, it is hoped that simply signing a spotlight on the shenanigans at FIFA over the World Cup bids may, at least, bring greater scrutiny to the next bidding process for the 2026 World Cup, which begins this year in Kuala Lumpur, Malaysia. Second topic, which brings us no joy, is racism in Australia, once again involving Indigenous Aussie rules player Adam Goodes. Goodes was playing for the Sydney Swans against Carlton and, having kicked a goal, did a war dance in celebration. This dance was seemingly directed at Carlton fans nearby and Goodes’ actions have led to vigorous debate (to put it mildly). Needless to say, Andrew Bolt began howling in indignation at this — an uppity Indigenous man who clearly doesn’t know his place. However, thankfully, Bolt’s view seems somewhat isolated, other players have been supportive and even the comments section of a Herald Sun story seemed evenly split for and against. I would point out, though, that this occurred during the Indigenous round of the AFL — the round to celebrate the contribution of Indigenous people to Aussie rules, and to Australia itself. "Indigenous round is a time to celebrate reconciliation and to reflect on changes that still need to happen, and I am proud that the AFL is part of this journey. Adam Goodes knows he has my support and the support of the AFL." I can only agree with Aly here — for too long white Australia has been trying to believe that Indigenous people don’t exist. Adam Goodes is certainly letting us know he and his people are well and truly part of Australia. The final story this week is not really sport as we know it, but an offshoot of more recognized road and mountain biking — extreme cycling. Kate Leeming is one woman who is really out there. She is planning a ride across Antarctica to raise awareness and money, about and for, HIV/Aids. To do this, she will be riding a special bike known colloquially as a fat bike. The name stems from the oversized tires, which are required for gripping the soft sand, river beds, puddles, water holes, ice and snow – soft and hard – that Kate regularly traverses. Kate’s first major cycle journey was the Trans-Siberian Cycle Expedition – 13,400km across Russia from St Petersburg to Vladivostok – to aid the children of Chernobyl. Then in 2004-05 came the Great Australian Cycle Expedition (GRACE) — a 25,000km journey through Australia, 7,000km off road, the toughest section being the 1,800km Canning Stock Route, with its 1,000 sand dunes and temperatures in excess of 40°C. Then came the Breaking the Cycle ride in Africa, another world-first journey — 22,000km from Senegal to Somalia exploring the causes and effects of extreme poverty. And then more recently, she took on the other extreme with a test run in Arctic Norway, based on the northern island of Spitsbergen. It seems that each time Kate conquers a frontier of extreme difficulty, it gives her the impetus to find another frontier even harder. So it is a natural progression from Spitsbergen to Antarctica. Kate’s Antarctic ride is a projected 1800km. It begins at Leverett Glacier, not far from the best known settlement in Antarctica, McMurdo Sound. From there, she will ride up to the South Pole, then down the other side to Hercules Inlet and journeys end. I say up, because the South Pole sits at around 2,800 metres in elevation — 600 metres higher than Australia’s highest point, Mt Kosciuszko, to put it into context. However, even then, parts of the ride will take her higher than that — to 3,000m at the highest points. The up leg will see her battle the famous katabatic winds of Antarctica. Air drops as it cools and thus the cold air of the polar plateau rushes off the edges and drops down with ferocity to the coast. Fastest wind ever recorded on Antarctica was 327kph, but even the average winds are listed as 80kph. Kate’s ride will be filmed and the film's showing will provide interest in the hurdles she faces and awareness of this dread disease. She will also be doing a speaking tour starting in Hobart in June, to talk about her previous expeditions across Russia, through Australia and across Africa, and discussing her HIV/Aids focused Breaking the Cycle South Pole expedition across the Antarctic continent. Like most days when I’ve finished an article, I like to head out on my bike and unwind. Today, even if the wind is strong against me, I’ll consider the katabatic flows that Kate will be battling and never complain about a hard day’s riding ever again.